The Bench Boost chip has the potential to make a significant difference for those who use it in Double Gameweek 35. That’s what last season’s events taught us as the first real opportunity for that chip brought great success, especially among the top 10,000 managers. In Double Gameweek 34 of the 2017/18 season, those at that level of the game who deployed the Bench Boost averaged 94.9 points. How did Bench Boosters do in DGW34 last season? As you can see from the table above, the Bench Boost was easily the most successful chip played in that round of action. Those in the top 10k who went for the Triple Captain scored an average of 83.3 points, Free Hitters were looking at 80.2 and Wildcarders 83.2. Crucially, the Bench Boosters in the top 10k on average scored 20.2 points more than regular teams. Two Southampton defenders, in particular, helped their owners to impressive points-hauls. Ryan Bertrand (£4.8m) and Jan Bednarek (£4.0m) got attacking returns in their first Double Gameweek 34 fixture, a 3-2 defeat at home to Chelsea, before keeping clean sheets in a 0-0 draw at Leicester a few days later. However, it was still disappointing for Fantasy managers who looked to clubs such as Chelsea and Manchester United as rotation between their two fixtures limited their potential. Romelu Lukaku (£10.8m), Eden Hazard (£11.0m) and Willian (£7.1m) were among the players benched for their second matches of the Double Gameweek. Meanwhile, Liverpool options went largely overlooked, but Trent Alexander-Arnold (£5.5m) got an assist and a clean sheet, Mohamed Salah (£13.2m) scored, and so did Sadio Mané (£10.1m) in a 3-0 win over Bournemouth. That meant they went some way to matching the key captain contenders from that week, with Salah and Mané both scoring the same number of goals as Lukaku, Harry Kane (£12.6m) and Jamie Vardy (£9.2m) despite having one fewer fixture than them. Of the top 16 points-scorers of Double Gameweek 34, 10 were players with two fixtures and six had just one match. How did Bench Boosters in DGW37 do last season? In the end, Double Gameweek 37 proved to be the most popular week for the Bench Boost chip last season – although the Triple Captain was the most deployed chip that week. After 22.18% overall usage in Double Gameweek 34, it was used by 28.72% for the penultimate Gameweek of the season. However, it proved not to be quite as successful compared to those who deployed a few weeks earlier. As you can see from the bar chart above, the average points in the last 10 Gameweeks of the season were higher for those who Bench Boosted in Double Gameweek 34. There was a 7.4-point gap between the average scores for Bench Boosters in Double Gameweek 34 compared to Double Gameweek 37.
Who will the top 10k be boosting? By looking at the most-owned players among the top 10,000 managers, we can get a decent idea of some of the players who will be added to Gameweek scores on the Bench Boost this week. Obviously, the more fashionable players in the midfield and forward departments tend to be on the more expensive side, with Diogo Jota (£6.2m) the cheapest across the two positions in the above graphic. It is likely in defence where the difference will be made with plenty of cheaper options, some of whom were probably on the bench in Double Gameweek 34. Matt Doherty (£5.3m) and Jan Valery (£4.1m) are owned by more than 40% of managers inside the top 10k and both have two fixtures in Double Gameweek 35. However, the latter is currently an injury doubt and his owners will have to wait on Ralph Hasenhüttl’s next press conference. 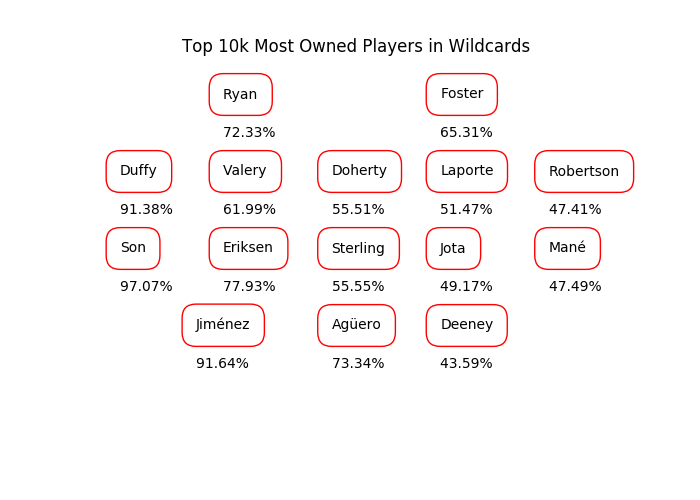 Troy Deeney (£5.9m), suspended for three matches after a red card against Arsenal, is another problem to be solved in the next few days, as he was the third most popular forward on Wildcards in the top 10k. Ryan to Ederson or Duffy to Laporte? Have to be first, right? If you've got 1 free transfer and play your bench boost chip will you have 2 free transfers the following week? Other than Laporte, any other Man City defender worth picking? Walker probably next best. Been a little unfortunate on attacking returns too but he'd be second to laporte for me. Is he safe gametime wise or unlikely to play all games? Members compare Bobby F for week 1-29 vs 30-34. Is double Liverpool defs and Firmino enough for GW36 when everyone and their dog will captain Salah/Mane? Price rise deadline this week ? Are people getting rid of Vardy this week? Lacazette and Firminho seem good replacements. Regarding the BB, after a disaster of a few gameweeks I've decided to use it as a mini wildcard (having already used my WC) and taken 12 point hit. Gunn, Kola, Redmond & Cathcart in for Etheridge, Pereira, McNeil & Tomkins. 12 of my 15 have double game weeks, and I've cleared out some who have a poor run, and brought in some who have a decent run to the end of the season. Or other transfers with 1.1ITB?? Vardy to Firmino next week.